Alberta Premier Rachel Notley speaks to media before the Speech from the Throne, in Edmonton, on March 8, 2018. 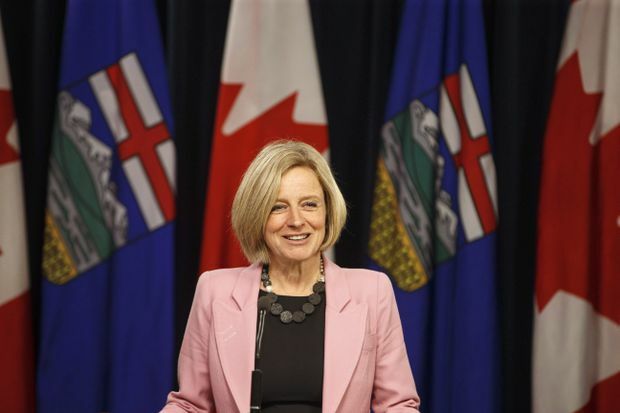 Alberta politicians have passed a motion to back Premier Rachel Notley’s battle for the Trans Mountain oil pipeline, but division remains on how to carry the fight. The United Conservatives, Alberta Party, and the Alberta Liberals joined with Notley’s NDP to back the government motion in a vote Tuesday. The final tally was 70-0, with Notley and United Conservative Opposition Leader Jason Kenney in the chamber for the vote. All sides agree on the need for the pipeline, but have disagreed over how Notley’s government has carried the fight to B.C. and to the federal government. The NDP voted down a United Conservative amendment designed to make that distinction clear. UCP house leader Jason Nixon said they voted for the motion anyway, saying it’s important to stop B.C.’s delay tactics on the project, which would triple the amount of oil flowing from Edmonton to Burnaby. Notley introduced the motion Monday. She said actions such as B.C.’s delay tactics leave Canada lagging while other countries eagerly fill new orders for oil. “I’m hard pressed to think of another country that so willingly handcuffs its economy this way,” Notley said. The motion urged all members of the legislature to back the government’s actions in getting Trans Mountain built, and to push Prime Minister Justin Trudeau’s government to do what it can to get the Kinder Morgan project completed. But United Conservative Leader Jason Kenney told the house Notley waited too long and has not done enough to force B.C. to stop obstructing the project, which was approved by the federal government in 2016. “We should prepare an entire suite of potential economic reprisals, saying that if they (B.C.) start a trade war, they’ll have to learn that Alberta will finish it,” Kenney told the house Monday. Greg Clark of the Alberta Party said the NDP government has failed to make the case to B.C. that Alberta shares its concerns on climate change. But government house leader Brian Mason said the government has been carefully leading the fight, and said it’s easy for those on the opposition benches to issue broad statements and threats. Notley has been fighting with B.C. Premier John Horgan’s government over what Alberta terms delay tactics on the pipeline, including court challenges and permit delays in an area that Notley considers to be a federal responsibility. The premier suspended negotiations on electricity sales and cut off wine from B.C. after Horgan’s government announced in late January it would not take in more oil from Alberta above current levels while it studies spill safety. Notley lifted the wine ban last month after Horgan reversed his stand on the oil moratorium and said he would instead seek a ruling in the courts. Last week, Notley announced her government would consider cutting oil and natural gas exports if B.C. continued to delay. Horgan said B.C. will stick to its legal plan to test its jurisdiction on environmental and economic grounds. “Ms. Notley can take care of business in Alberta to the extent that she believes she has to take on British Columbians,” Horgan said Tuesday. B.C. has retained lawyer Joseph Arvay to prepare a reference case in the courts to test the province’s right to protect its land, coast and waters.